Protests against high fuel prices in France have propelled climate policy to the forefront of the political debate, just a few days before Poland hosts the UN’s annual conference on climate change, with a focus on the “just transition” to low-carbon energy. 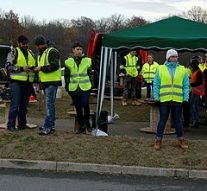 Since the 17th of November, protesters clad in fluorescent jackets, dubbed “yellow vests”, have blocked highways across France, setting up burning barricades and deploying convoys of slow-moving trucks to complain about fuel prices. The unrest, initially focused on the French carbon tax – which added about 10 euro cents to the litre of petrol and diesel – reached new heights in Paris over the weekend when police clashed violently with thousands of demonstrators on the Champs-Elysées. A carbon tax is a fee imposed on the burning of carbon-based fuels (coal, oil, gas). More to the point: a carbon tax is the core policy for reducing and eventually eliminating the use of fossil fuels whose combustion is destabilizing and destroying our climate. A carbon tax is a way to have users of carbon fuels pay for the climate damage caused by releasing carbon dioxide into the atmosphere. If set high enough, it becomes a powerful monetary disincentive that motivates switches to clean energy across the economy, simply by making it more economically rewarding to move to non-carbon fuels and energy efficiency. Carbon chemistry is potent but also simple. The amount of CO2 released in burning any fossil fuel is strictly proportional to the fuel’s carbon content. This allows the carbon tax to be levied “upstream” on the fuel itself when it is extracted from the ground or imported into the U.S., which vastly simplifies its administration. Every week seems to bring another disaster rooted in climate change. Historic floods, persistent droughts, raging wildfires, melting glaciers. Setting off food shortages, civil unrest, mass migrations. The frequencies are rising. The last colder-than-average month in NASA’s global-temperature database was July 1985. On Jan. 18, 2017, two days before the inauguration of Donald Trump, NASA’s Goddard Institute for Space Studies announced that 2016 was the hottest year on record (global average) — the third consecutive record-setting year. Is a carbon tax the answer to the clean energy battle? A carbon tax will likely reduce domestic energy consumption. However, unintended consequences pose some problems to consider. In economics, many situations are examined using the supply and demand curves. The intersection point is the market equilibrium, the most efficient situation, or the point where nobody, as in consumers or producers, can be made better off by moving away from it. This market efficiency exists in the absence of externalities, which are defined as an extra cost to society not accounted for in the supply and demand curve. When a negative externality exists, as the impacts of using energy on the environment, the market cannot capture this cost and has to be adjusted. This adjustment can be done with a tax, in this case, a carbon tax. If the tax matches the impact, the new equilibrium price and quantities represent an efficient situation. With the negative externality of carbon emissions, a tax would reduce the amount of energy used and partially “pay” for the likely negative effects of carbon emissions in the future. However, this extra cost to producers might cause some problems for the economy. An opinion poll published in Le Journal du Dimanche on 18 November found 62% of French people give the highest priority to purchasing power – even if that means delaying the energy transition. To be sure, the energy transition will affect some industrial sectors badly. But the European Union has limited competences on social policy. Moreover, EU Member States are often left on their own when it comes to dealing with the social consequences of climate policies that are often designed at the European level. Why are yellow vests on the street? The carbon tax is not a damage per se to the French people, but these economic adjustments should be inserted in a broader reform to limit their social impact.